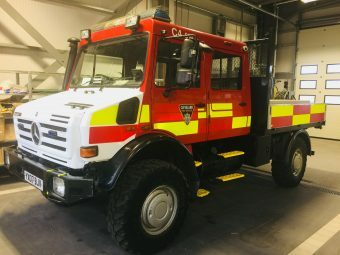 Members have been invited to go on-board the Brigade’s special off-road appliance (UNIMOG) to see what work is being done to combat arson attacks. Between April 2017 and March 2018, there were 53 deliberate fires on Eston Hills. Although there has been a slight reduction for April and May 2018, to date, the Cleveland Fire Brigade has still attended 13 fires in these two months which were caused deliberately, down from 29 last year. As a result of the public meeting called by local MP Anna Turley in February last year, the Eston Hills Action Group was established. It is chaired by Barry Coppinger, Police and Crime Commissioner for Cleveland, includes representatives from Cleveland Fire Brigade, Cleveland Police, local authorities, Friends of Eston Hills, archaeology groups and, Redcar MP Anna Turley. Simon Weastell, Head of Emergency Response for Cleveland Fire Brigade, said “Deliberate fires on the Eston Hills are wholly irresponsible and apart from causing immense environmental damage, they also divert resources away from emergencies where lives may be at risk. Cleveland Fire Brigade’s UNIMOG, stationed at Grangetown Community Fire Station is an off-road appliance that can provide a rapid and effective response to fires on the hills and reach areas of difficult terrain, which ordinarily cannot be reached with a normal fire appliance. Its capabilities include ,a water storage tank, hose reels and other firefighting equipment and it is staffed by a crew of four firefighters..
PCC Barry Coppinger said: “The Eston Hills Action Group was established to develop multi-agency solutions to problems which have plagued residents and landowners on the Hills for years. Member of Parliament for Redcar Anna Turley said: “The Eston Hills are undoubtedly a safer place for local residents to enjoy as a result of the work of the action group and I want to congratulate all of the partners on the work they have delivered so far. “The number of arson incidents is down and lots of improvements to secure the hills have been made, but there are sadly still fires being started which shows the work still to be done.